A professor once made a comment on Heaven; a comment which has lingered in my mind long since its utterance. It’s absurd, he explained, how some people can believe their deceased family members are looking down on them from Heaven. Souls in Heaven are happy! Why would they look back on earth? In their Savior’s presence, why would they even care about what’s happening on earth? This bothered me. I didn’t dare voice my objections, but allowed my professor’s disgust to simmer in my mind. My grandmother passed away when I was eleven years old, right before my fifth grade graduation. After my grandmother died, my mother shared with me something grandma had told her. Grandma said that every time you find a penny, I’m thinking of you. 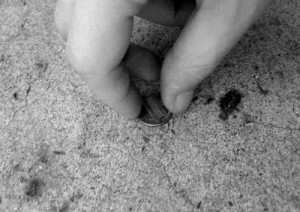 When I would see a penny on the ground, I would shout out excitedly, overjoyed by the thought that Grandma was thinking of me. So when my professor made this comment, it felt like he was directly attacking me and my family. Deceased grandparents can look down from Heaven for weddings, celebrations, graduations, right? As I grew older I accepted pennies on the ground for what they were, mere pennies that happened to fall on the ground. Then today happens. Today I tagged along to an “Elder’s Brunch” as my dad titled it. Mom, Dad and I went to Bridgeman’s to eat brunch with several of my grandmother’s old friends. Grandma grew up with these people. They attended the same church. It was a unique experience to be able to meet them. Later, hours later, it hit me, dawned on me or any one of the many cliche sayings used to describe an epiphany. Grandma. We were with grandma’s friends, and I found a penny on the ground. I flipped the penny over. 1971. In 1971, my mother was 23 years old. Right now I’m 21 years old. Coincidence. Maybe. Close enough for me. In 1971, my mother was around my age. Interesting. Why would it be sad for those in Heaven to look down on their family members? Maybe they don’t care, but my human heart, soul, gut, whatever you might call it, hopes that’s not true. To me it seems like weddings would be little treats. To see great grandchildren would be a blessing. Maybe God just tells them, “Hey, this grandchild got married to a wonderful man today and they’re living for me, witnessing in Barcelona, Spain.” Or maybe, “This grandchild graduated from high school and is going to Evangel University. She doesn’t believe it yet, but I have great things in store for her.” Perhaps it’s like a Facebook notification. The cloud floats up in front of them and they can see pictures of the big events with little captions underneath. Daniel Antonio Gomez was born today, which makes him your 7th great grandchild. I don’t know. God’s imagination is MUCH greater than mine. Why limit him? When my mother passed away, it was just before I left on a mission trip to Italy. I thought about heaven a lot, because the thought of her being with God, and not a corpse was the only thing that got me through that time. One night on that trip I felt rather alone and even questioned why I was on that trip in the first place, when I felt so broken. I think God allowed my mother to visit me in a dream to comfort me, to allow me to heal enough to reach others for Christ. I try my best not to take comments about heaven too seriously, because nearly everyone alive hasn’t literally been there. Now, if they base it off a specific scripture, I’ll look it up and see if my interpretation agrees with theirs. This is great stuff to think about! Previous Previous post: Thoughts on Harry Potter.